NOTE: LOCATION CHANGE FOR THIS EVENT! WE WILL MEET AT CAMERON VILLAGE REGIONAL LIBRARY FOR APRIL AND MAY. Get To Know Your Potential Buyers at Tech Tuesday! 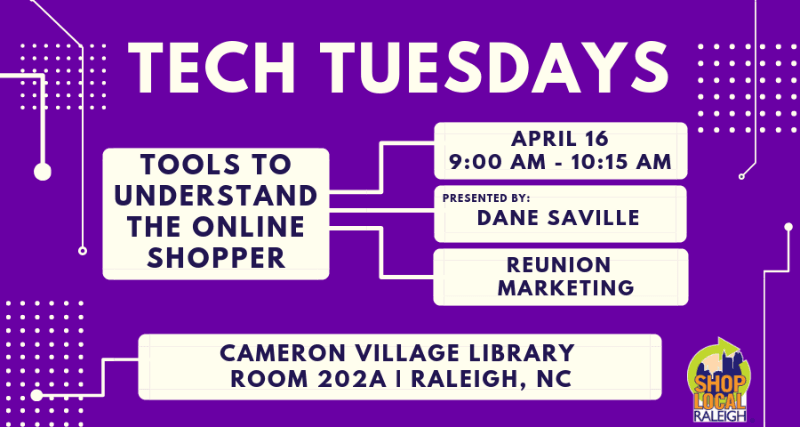 Dane Saville, Brand & PR Manager for Reunion Marketing is hosting our April Tech Tuesday workshop. Dane will discuss vital tools that can help any business understand the modern (online) shopper. This includes three essential tools: (1) Two free tools that can give perspective on what shoppers are searching for and how they search for it; (2) One subscription tool that offers direct feedback on how shoppers are behaving on your website. In addition to that, he’ll offer some bonus insights on new programmatic channels’ efficiencies compared to traditional media. A free monthly workshop series for Shop Local Raleigh members covering a variety of topics for the small business owner. Free parking onsite. Not a member? Join today!